This charger consists of a small generator which attaches to the wheel of a bicycle and a battery. The battery is charged by the generator which in turn charges a cell phone, GPS navigator or any device that can be powered by a USB port. The battery insures that the device's battery receives consistent power even with changes in riding speed. A universal mount is included to attach a cell phone to the handlebars. 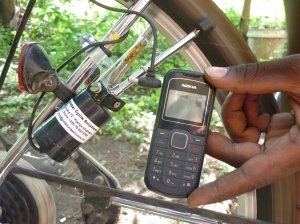 The charger is manufactured by Global Cycle Solutions inc. which is based in Tanzania. The charger can be ordered worldwide online.